(by Daniel Pipes, DanielPipes.org) – The key issue at stake in the battle over the twelve Danish cartoons of the Muslim prophet Muhammad is this: Will the West stand up for its customs and mores, including freedom of speech, or will Muslims impose their way of life on the West? Ultimately, there is no compromise: Westerners will either retain their civilization, including the right to insult and blaspheme, or not. Germany’s Die Welt newspaper hinted at this issue in an editorial: “The protests from Muslims would be taken more seriously if they were less hypocritical. When Syrian television showed drama documentaries in prime time depicting rabbis as cannibals, the imams were quiet.” Nor, by the way, have imams protested the stomping on the Christian cross embedded in the Danish flag. Norway: “We will not apologize because in a country like Norway, which guarantees freedom of expression, we cannot apologize for what the newspapers print,” Prime Minister Jens Stoltenberg commented. Germany: “Why should the German government apologize [for German papers publishing the cartoons]? This is an expression of press freedom,” Interior Minister Wolfgang Schauble said. France: “Political cartoons are by nature excessive. And I prefer an excess of caricature to an excess of censorship,” Interior Minister Nicolas Sarkozy commented. Poland: “The bounds of properly conceived freedom of expression have been overstepped,” Prime Minister Kazimierz Marcinkiewicz stated. United Kingdom: “The republication of these cartoons has been unnecessary, it has been insensitive, it has been disrespectful and it has been wrong,” Foreign Secretary Jack Straw said. New Zealand: “Gratuitously offensive,” is how Trade Negotiations Minister Jim Sutton described the cartoons. United States: “Inciting religious or ethnic hatred in this manner is not acceptable,” a State Department press officer, Janelle Hironimus, said. 3. 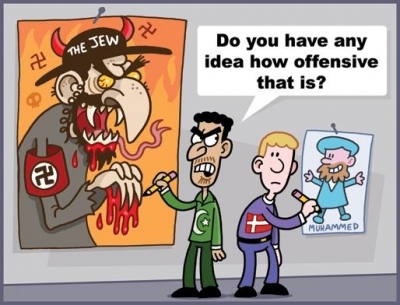 To view video of Muslim reaction to the cartoons, click here and view Clip #’s 1025 and 1022. Do you think that on the whole, Muslims support a right to free speech for all? Which one of the 10 commandments, adhered to by Muslims, Christians and Jews, did the imams break by distorting the facts of the newspaper/cartoon controversy? 5. Should any government representatives apologize for, or criticize the actions of, the free press? Explain your answer.